I received an email from Karen iReport (Second Life name obviously) that CNN have now moved on from a small ‘hub’ presence in Second Life and onto their own island – which now includes a ‘classic’ automotive theme. It is great to see a positive growth move from CNN given the exit of Reuters not so long ago – I quote from her press release / email to me. As a matter of fact, CNN is no longer a hub within SL, we have moved to our own island! The new space features â€˜in-worldâ€™ geographic elements and meeting spaces, including a virtual drive-in theater, complete with a snack bar and vintage cars where visitors can view recent in-world iReports, pick up iReport gear to dress their avatars and check out the iReport.com/secondlife page. As you can see, as others are abandoning their presence in the SL community, CNNâ€™s mission for iReport within Second Life remains as it did upon launch in 2008: to provide Second Life residents a way to identify and share news and events happening within their virtual community through the submission of â€˜SL iReportsâ€™. 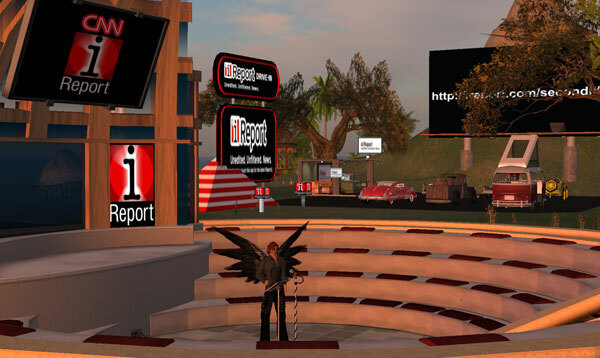 To celebrate our expansion, please join the in-world iReport staff and SL residents on Tuesday, Feb. 3rd, from 12 noon ET noon to 6 p.m. ET (9am SLT â€“ 3pm SLT). We’re going to have an open house including some very special guests, and island tour (click here to view screen shots of the enhancements) and even some dancing!